A classic entry, Alex Hotel, Perth (photo: Anson Smart). 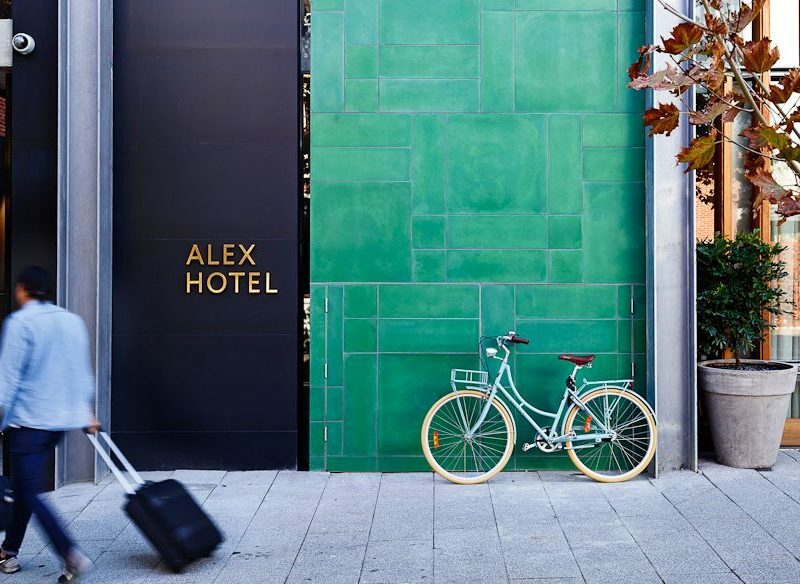 The team behind Little Creatures Brewery has opened its first hotel in Perth: the Alex. Fleur Bainger finds a similarly craft-driven, independent haven. When Fremantle’s Little Creatures Brewery sold to Lion for a cool $382 million in 2012, many made the assumption the original owners would ride quietly into the sunset, perhaps aboard a luxury yacht? It was not to be. Instead, the four founders of Australia’s most successful microbrewery got stuck into new projects: opening hip restaurants, creating a biodynamic bakery, launching a locally roasted coffee brand, resurrecting a heritage area, and building an inner-city distillery. 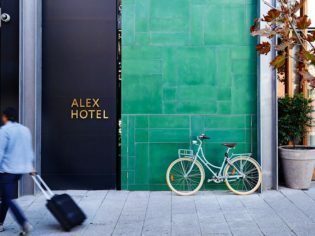 No one expected them to open a boutique hotel as well, yet, in May, they did, and it’s called Alex. Miles Hull is at the helm. He spent nine years with the Creatures team, first as its general manager of hospitality, and later as the head of creative development and marketing. But hotels were what he trained in (in Switzerland, if you don’t mind), and it seems his colleagues have backed his dream of opening one. The result has their trademark craft style stamped all over it, right down to the glass-bottled water filtered on site, and the ceramic tissue boxes handmade by a local artisan. There’s plenty that’s unconventional, too: the name, for example, which is meant to evoke a friendly personality. They do, however, have an eye for opportunity. Alex is, I’d venture, the best located hotel in the western capital. Perched on the doorstep of the Perth Cultural Centre (home to the Art Gallery of WA, WA Museum, the Urban Orchard, and more), mere steps from cool William Street and a stone’s throw from the State Theatre Centre and Perth’s central train station, it’s at the heart of Perth’s re-enlivened core. We arrive on a Friday afternoon, passing a row of free-to-use, retro bikes before being greeted by two bubbly women who check us in informally; there’s no front desk dividing us. No iPads, either, just a warm, one-on-one welcome. We’re handed faux-pine swipe cards that unlock the elevator’s security system and whisk us to the sixth floor. I wasn’t expecting top-level views for the price of a mid-tier room. It’s the first of many surprises. A contemporary hipster-meets-Vogue aesthetic permeates throughout. Our room is compact, sure, but floor-to-ceiling windows and a balcony overlooking the busy urban strip below gives it life. More light floods in via the glass-encased shower that cheekily faces the outside world. Exhibitionists will love it, but the shy will appreciate the electric modesty blinds encased in the double-glazing. Our custom-made bed is dressed in silky, Italian-made Beltrami sheets and extra-long, squishy pillows. The Bemboka Turkish cotton towels and throw add another layer of luxe comfort, as do the locally made Sodashi bathroom products. There’s a quaint pencil and steel sharpener by the bed and a do-not-disturb sign declaring ‘dreams in progress’. I love it all. But the six-storey, 74-room haven isn’t about the rooms, as a little black book on the bedside table reminds us – communal areas are the focus. There’s deliberately no mini bar, nor any room service. Alex wants to draw you out to play. Up to the mezzanine, Alex Hotel (photo: Anson Smart). We descend to the mezzanine, lured by the delightfully unconventional honour-system bar and pantry. It’s hard not to feel like kids raiding the liquor cabinet, as we select Margaret River craft beers. We waft over to the record player (with headphones attached) and slouch on cushion-topped, velvet love seats, leafing through edgy magazines. I’m seduced by the hipster-meets-Vogue interior styling. It’s the sort of home I’d love to live in, with the sort of décor I’d love to own. We’ve brought our one-year-old, and once he’s asleep we tiptoe to the rooftop. While eyeballing the baby monitor we lounge in white scoop chairs and listen to live covers being played on a pub balcony opposite. Northbridge is the Kings Cross or Fitzroy of Perth; we’re at the heart of it without being in the thick of it. The staff suggest we order dinner from the attached restaurant, Shadow Wine Bar, and deliver it to us on the mezzanine. The Alex’s Lobby Espresso Bar is where it’s at come morning (photo: Anson Smart). Thrilled, we pour another wine from the honour-system fridge and enjoy a romantic dinner as we watch the bar hoppers. We don’t (really) mind that we’re separated from the nightlife. And that’s Alex’s charm: its communal spaces are so inviting, you can happily opt for a night in. Crafty indeed. Why be a follower? This is a cleverly put-together, chic but casual hotel that has plenty of elements we often wish hotels had. Original thinking, an obvious love of sharing and handcrafted touches tick all the boxes. We rated: The 12 noon check out. How civilised! And that weekend breakfast runs 6.30am–11am. Sleep in but don’t starve. We’d change: There’s a reason complimentary ear plugs are in the bathroom: noise from the party street below, while muffled, permeates the double-glazing. I thought it was atmospheric – the husband did not. Notes: We paid $255 for a ‘medium’ room, which comes with a balcony and includes an excellent breakfast. Large rooms are only $10 more but don’t come with a balcony; extra-large rooms do have balconies, however.